South East Local Land Services has $125,000 of NSW Office of Environment and Heritage Saving Our Species funding, available over five years, to assist land managers to undertake project works that protect and enhance yellow-spotted bell frog habitat. Senior Land Services Officer Annelies McGaw said this inconspicuous frog is one of the most endangered vertebrates in the NSW south east region. “It is listed as critically endangered in NSW and endangered Australia-wide,” Ms McGaw said. 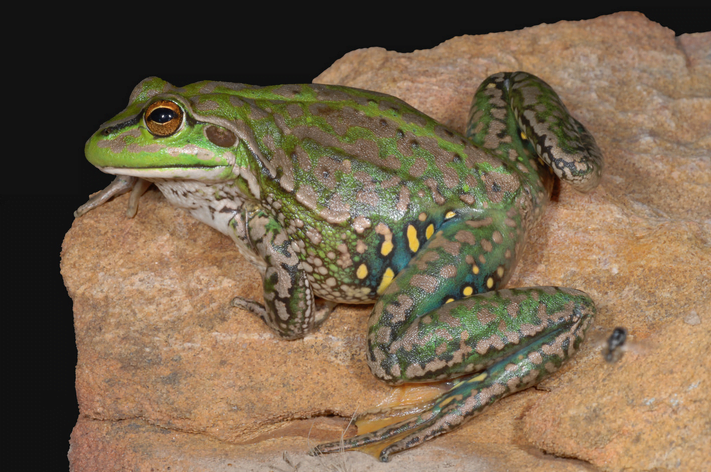 “The yellow-spotted bell frog was once common on the northern and southern tablelands, but was almost wiped out after the chytrid fungus arrived from Africa in the early 1970s. The species was presumed extinct for nearly 30 years, but was rediscovered in 2008 on the southern tablelands. “This frog is known to exist in the Blakney and Oolong Creek catchments. “We now have a chance to work towards rescuing the species by protecting critical riparian habitat with this funding and the assistance of local land managers,” Ms McGaw said. Funding will be made available to eligible land managers for project works to fence riparian areas, plant shrubs and trees, control erosion, establish tree corridors between waterways and farm dams, and install alternative stock watering systems. These works will also help to improve properties, farm productivity and the landscape. To kick-start the yellow-spotted bell frog project there will be a discussion, to be coordinated by Gunning District Landcare with Dalton Community Association, about the importance and maintenance of riparian and aquatic vegetation for the species. This will be held at 5.30 pm on 11 November, following a free barbeque and the official opening of the Oolong Creek restoration project. Media release from South East Local Land Services. Featured image from NSW Office of Environment and Heritage.